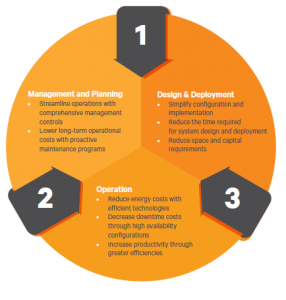 Smart Solutions help you cost-effectively achieve and manage higher levels of density, availability and efficiency. The SmartSolutions approach gives you the efficiency, economy, interoperability and control to implement an infrastructure strategy that outperforms any you’ve ever seen. Increase productivity through greater efficiencies. The SmartCabinet™ solution is a turn-key infrastructure offering for network closets, small server rooms or data center seeking standardization. Standardized configurations that are tailored to the application, factory integrated, validated and tested. High availability with network independent remote management and extensive emergency service coverage. The SmartRow™ infrastructure solution has a room-neutral design that lets you avoid many of the significant costs that come with a conventional data center buildout. Intelligent, integrated infrastructure using row-based building blocks. The SmartAisle™ offering can increase your efficiency through row-based power and precision cooling systems. SmartCloset™ is the new standalone self-contained rack from Vertiv, along with inbuilt power and cooling. It facilitates the housing and trouble-free installation of active IT equipment like switches, routers and so on – for which, an open environment is not conducive for healthy performance. SmartCloset™ is suitable for any location like factories, warehouses, branch offices and retail stores where ambient conditions and temperatures are not in control; and also where dust and dirt are common.